"Why Technology Training is Broken:Overcoming the Challenges"
Technology training is broken and needs to get back in step with the times. Traditional training events will be left behind, but companies who evolve and move toward informal learning will not. Why traditional choices like event training are still popular choices? How can successful companies combat these challenges of technical training? What is the uniqueness about training classes offered in Pinnacle Series and what are the key benefits of it? What are the factors that must be considered when implementing a training tool? 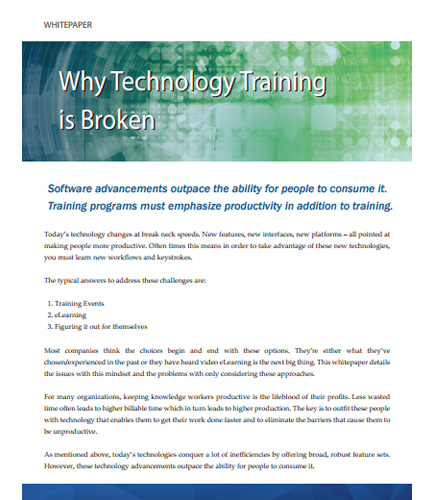 Read this whitepaper on Why Technology Training is Broken. It’s time for a modern approach! !